Sticking with the less-is-more format, 2017-18 SP Game Used Hockey promises six cards per box, including one autograph or premium relic among the four total hits. After multiple tweaks over the years, 2017-18 SP Game Used NHL essentially stays true to the 2016-17 edition. 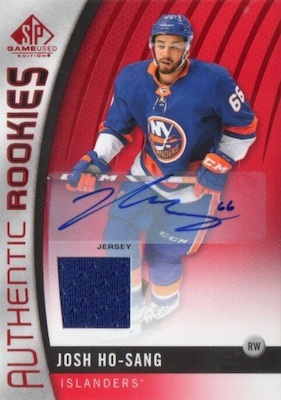 Comprising two cards in each box, the 2017-18 SP Game Used Hockey checklist starts off with base cards and the Authentic Rookies subset, both of which are jersey-numbered for extreme rarity. This includes the true jersey number Auto Variation that adds a signature to the final card in the production run (i.e. #99/99). However, there are also many parallels, including autographs and relics, for each card that bring the overall total much higher. 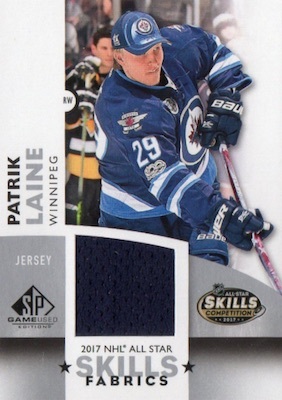 Of course, 2017-18 SP Game Used Hockey has an extensive selection of high-end inserts. Signed options include the numbered Banner Year Autograph cards featuring actual pieces from banners at various events like the NHL Draft, All-Star Game, and Stanley Cup Final. There are also Draft Day Marks with signed letterman cards limited to 10 per letter for veterans, and 35 per letter for rookies. 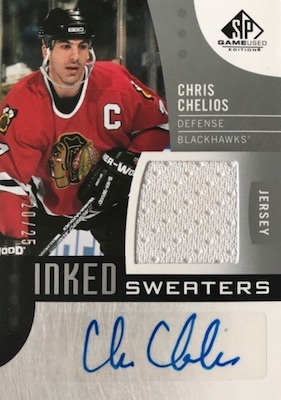 Among the other signed offerings is Inked Sweaters, which has a Patch parallel, and 500-Goal Club Marks (#/25 per letter). Last, but not least, are the many 2017-18 SP Game Used Hockey memorabilia cards. Supreme Patch (#/15) is joined by a parallel that substitutes other gear, like gloves, pads, skates, and sticks. Built around one of the most unique UD displays for jersey pieces, Frameworks (1:12 packs) gives the relics a more personal feel. 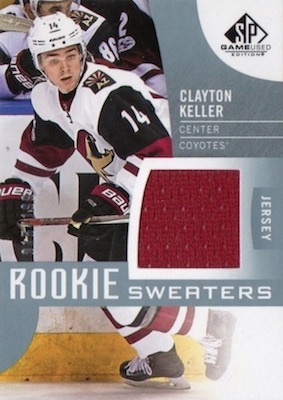 Rookie Sweaters, numbered to 199, provide another choice for the top young talent. Many relic sets also expand to cover multiple events under the same insert. This includes Game Gear (#/6: 2017 All-Star Skills/Centennial Classic/2017 Stadium Series), and Game-Used Pucks from notable events such as the 2017 NHL All-Star Game and Stanley Cup Final. These pucks each average 1:720 packs. 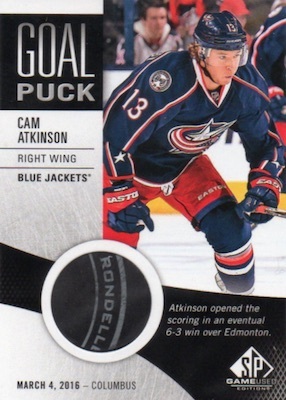 In addition, Goal Puck cards are somewhat easier— but still tough—at 1:240 packs. Another memorabilia insert casting a wide net (pun intended) is the Material Net Cord line. 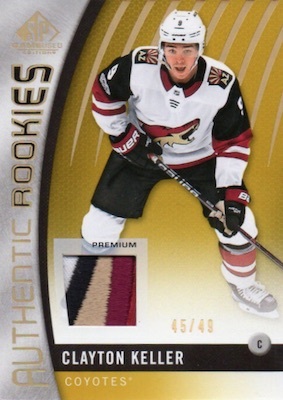 Each numbered to 35 copies (or 25 for the Stanley Cup version) for several different events, there is also a one-of-one Net Cord Shield Logo parallel. 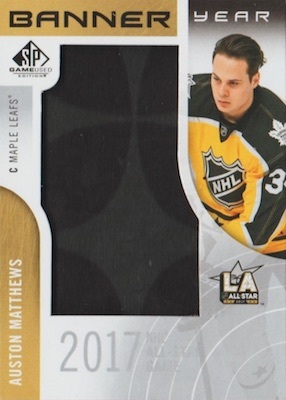 The Banner Year relic set is similarly broken down: 2017 All-Star – 1:10; 2017 Stadium Series – 1:18; 2017 Stanley Cup Final – 1:14; 2017 Winter Classic – 1:18; and NHL Draft – 1:9. Finally, the 2017-18 SP Game Used Hockey checklist closes with 2017 NHL All-Star Skills Fabrics (1:3 packs), 2017 NHL Stadium Series Fabrics (1:10 packs), and NHL Centennial Classic Fabrics (1:10 packs). Adding to that are Duals (1:20 - All-Star Skills only), as well as Quads that fall for each set at 1:120 packs. In addition, Patch parallels apply low-numbered versions of 35 copies or less. 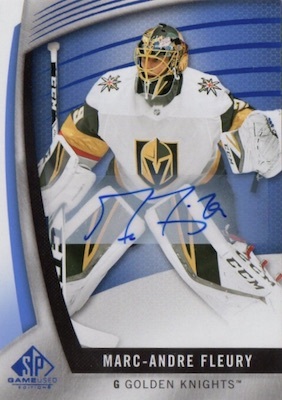 View 2017-18 SP Game Used NHL cards on eBay. PARALLEL CARDS: Green Storm 1/1. For instance, the signed Auston Matthews is #34/34. Overall Odds: Base (#1-85) - 1:7; Rookies (#86-185) - 1:5. Overall Odds: Base (#1-85) - 1:20; Rookies (#86-185) - 1:12. Overall odds - 1:4. Specific group odds noted below. 16 cards. Serial numbered #/35. Overall odds - 1:8. Specific group odds noted below. Overall odds - 1:12. Specific group odds noted below. 54 cards. Serial numbered #/6. 135 cards. Serial numbered #/15. I did four boxes and a buddy did the other six from a case. Simply not much there for the price. 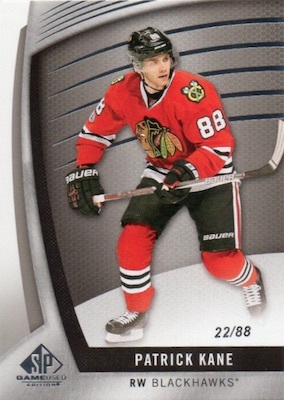 I have been a HUGE fan of SPGU Supreme cards and I hit a Jason Spezza stick. The mem was a joke, it looked like a piece of wood you would get from a scrap heap at a construction site and that was my best hit. Not impressed with this case. Watched a few breaks and overall was not too impressed by what came out. I watched 3 case breaks and it really seems like these boxes should be selling for $39.99, not $120. I was really unimpressed with the “hits” and will be staying away from this one. Not the greatest product but i disagree with all those that say its crap. Too bad you found bad boxes. that will happen in any product. I did a case and have to say i was ok with the hits. Not huge hits but a variety of ok cards. What do you expect from a $130 Cdn box? Not the best, not the worst product. Few issues though. 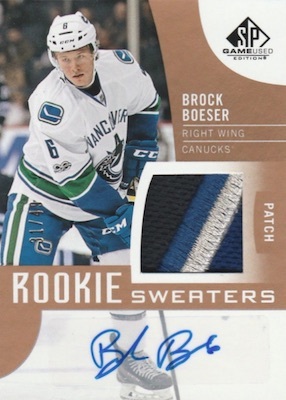 Too many manufactured and event used patches et jerseys for a product that is called SP Game Used… The problem with this set is that there are a lot of rookies and the chances to pull something good are quite slim, especially that this year two of the main rookies have low jersey numbers (Keller and Boeser). Add to that the numerous parallel and variations (Rainbow, Orange)…The banners are just awful. I’m not a big fan of the All Star cards. 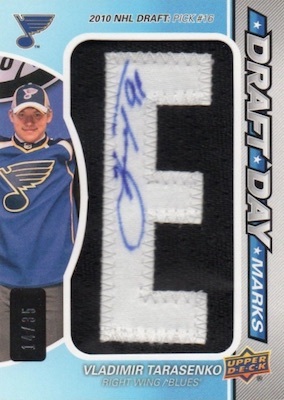 But all in all, SP Game Used remains one of the trade marks of UD with its Net Cord, Draft Day Letters, Pucks, or Base set numbered to the Jersey Number sets. There are some very attractive cards and some very ugly cards here. 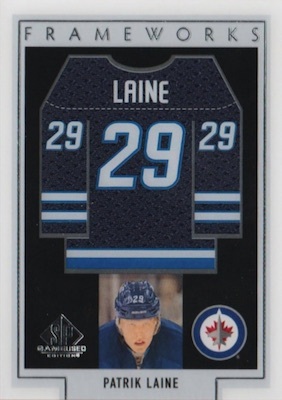 The numbered cards look good as do the banner cards and the jersey cards from the outdoor games (cenntenial classic, stadium series and winter classic). There is however a glaring error on the Maple Leafs centennial classic quad jersey card. UD in its uniformed wisdom itentifies Nylander as Marner and visa versa. Terrible final editing on UD’s part. Not a product I spend on buying packs, but will buy singles on the secondary market however. Went to another local and busted 8 more boxes from a new case. Sadly the Supreme had walked out the door in the two boxes I didn’t get. This was much better than my previous break. Still not a fan of the Banner cards, I did totally luck out with a McDavid Net Cord and in the final box hit the Boeser auto with odds of 1:24 cases. Still a major hit or miss product and let’s face this years rookie class is not exciting so that is a downer, not UD”s fault not every year can have a McDavid or Matthews. This might be the worst product I have bought this year. 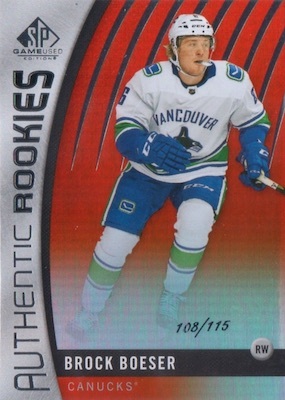 Bought two boxes on sale and my best hit was a Gilles Draft Day Mark /35 – Other hits were a Doughty patch, a Schultz Patch and a Keller draft day banner. Absolutely no re-sale value and the best part are the numbered base. Nice looking product but filled with junk. Not bad, but have a question see if anyone else had this happen. I got a Noah Hanifin blue auto, but it’s signed in faint silver marker? Is this an instance of the player having his blue marker die or is this a variant?